Books I and II of Sebastiano Serlio’s Geométry and Perspective are not autonomous books but are part of a project, more vast, of a treatise on architecture divided into several books which were published independently of their order in various European cities between 1537 and 1551. 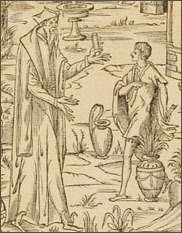 They are the third in the series after Quarto libro on the orders (1537) and Book III on antiquities (1540); they were published in Paris in 1545 by Jean Barbé in a bilingual edition, richly illustrated with 132 woodcuts, of which 24 are full page. Both books were explicitly intended for very few readers, such as architects able to draw with a ruler, a square and a compass, experts in geometry, able to reproduce diagrams, and to make the most of graphic experience by applying it to resolving problems likely to show up in a professional activity. The book Geometry opens with definitions of the point, the line and the surface, taken from Euclid’s Elements, followed by definitions of the angle and the regular and irregular polygon. The following part is devoted to the methods by which the architect learns the ways to enlarge, reduce and divide proportionally polygonal figures, in particular the method to reduce “to a perfect square” an “imperfect” form (an irregular polygon with four angles) without changing its dimensions. Finally this part teaches the way to “scale [the] works up to larger versions in proportion to the small” (f. 8, Hart & Hicks 1996, p. 15). The most interesting contribution of this book is the part devoted to curved lines. For example we see the way to draw an arc whose height is less than a half-circle. The arches of this kind made by masons undoubtedly “look correct” or match to the drawing of the same curvature made “with a pair compasses”, but the method suggested by Serlio, no less “practical” than that used by masons, is done with a compass and because of that, is made worthy of the profession of architect. In this case, as in that of “oval” shapes illustrated a little further in the treatise, Serlio represents the degree of culture which architects had reached before the studies that Federico Cammandino would begin soon after on antique sources, bringing up to date the knowledge of the Ancients again on circular curves, conical sections and the other types of curves. Serlio’s Book I does not really treat pure geometry but rather geometry applied to solving the problems that an architect could encounter in drawing his project. In this sense this book has an obvious heuristic link with the following book on perspective. Serlio defined geometry himself as the study of figures made of “some various intersections of lines”. If in Book I the treatment of the intersecazioni occurs for polygons rendered in a scale drawing, in Book II everything takes place in perspective; but the form, the liking for recutting, reducing and enlarging the geometric figure remain the same. And this is the moment to recall that intersecazioni is the term used by Alberti in the De pictura in order to define his method of rendering perspective. The only passage in which Serlio makes explicit reference to the rule of optical perspective is found in Book I, and not in Book II; the architect “should first, having previously chosen the place, – whether a column, tower or wall – and whatever element to want to ornament it with – whether windows, statues, inscriptions or whatever – chose the most suitable distance for viewing the element. Then, at eye level – the eye should be the center – he should draw a quarter part of a circle” (f. 9v, Hart & Hicks 1996, p. 18). A few lines above, Serlio evokes Leonardo da Vinci: “All the elements that recede from our sight are that much diminished because the broad expanse of air erodes our sight” (ibid.). The second book on perspective is divided into three short treatises: the first devoted to the ground plan in perspective, the second to bodies in perspective, the third to “material” perspective in stage design. Serlio declared he wanted to keep a low profile and he organized the treatise by themes he developed in lessons of growing complexity. The object was to teach the strict minimum to permit one to draw an architectonic idea in perspective. In fact, the author does not seem to be very enthusiastic about writing on the subject. He remembers that perspective is “an art which is better taught orally face to face than in writing and drawing” (f. 25, Hart & Hicks 1996, p. 37). Thus he affirms, “I shall make a great effort, in as brief a way as is possible for me, to shed as much light on the matter as will be sufficient for the needs of the architect (ibid.)”. A little further in the treatise he adds “if I do not please people who are curious to know things in great detail and to get to the bottom of every issue, I shall at least please those who know little or nothing, and this was always my intention” (f. 39, Hart & Hicks 1996, p. 51). This is not a simple rhetorical device, but certainly the expression of his knowledge of his own limits, or the wish to clarify operations and concepts necessary for a useful activity while avoiding complications which would be as boring to the author as to the reader. Book II did not earn its author a good reputation as a theoretician in this area, quite the contrary. Egnazio Danti was aware that Serlio’s explanation for the second method is erroneous, even if he judged that the error was due to a misprint (1583, p. 82). In the 19th century, N. G. Poudra showed that the first method is also erroneous, more specifically in its second part (1864, pp. 147-152). Presently, critical evaluation is no better; Martin Kemp dispatches Serlio’s incompetence in perspective and is astonished that his drawings work well, whereas his first method is wrong, and that in the second based on the “point de distance”, the distance given is inexact (1994, p. 78). But if one puts aside the author’s errors and if one reads the whole treatise, on is aware that Serlio applies his second method correctly. His ambiguous commentary on the first method (“the rule I have given above is provable and excellent”, f. 27, Hart & Hicks 1996, p. 39), is not helpful in forming a good idea of his competence as a theoretician of perspective. In fact a rule in the area of perspective establishes a precept and implies sure results, otherwise it is not a rule. Strangely for Serlio this rule is only “probable”, that is, trustworthy, “but not certain”, as if it did not guarantee continual results. The method for drawing a solid body in perspective is very basic: first one draws the foreshortened plan and then one transfers the same illustration to the desired height by adapting it according to the same main vanishing point. Then one joins the angles of the two figures: “in this way a transparent octagonal body will be formed” (f. 35, Hart & Hicks 1996, p. 48). The “transparent bodies” refer to the treatise on perspective by Piero della Francesca, in which the solids are drawn in the form of “transparent bodies”, and to the regular solid or empty bodies that Leonardo da Vinci made for the De divina proportione by Luca Pacioli, which contains, as we know, text plagiarized from the Libellus de quinque corporibus regolaribus by Piero della Francesca. The method used to distribute buildings in perspective space, which Serlio calls “the plane method”, consists in using a method which, because of the proportional properties of a checkerboard in perspective, allows one to define the elevations correctly by simply using a compass. Serlio takes the “plane method” from the passage in De pictura, in which Alberti teaches how to draw buildings on a foreshortened tiled floor, by putting them in proportion to the ground plan and the height of the main point (II, § 33). From reading Book II alone, one thus deduces that Serlio is acquainted with the treatises of Leon Battista Alberti, Piero della Francesca, Leonardo da Vinci, Jean Pélerin and Albrecht Dürer. Nevertheless, since Serlio was Baldassare Peruzzi’s pupil and collaborator, and since Serlio recognizes that he owes much to the generosity with which Peruzzi shared his knowledge, one might suppose that he learned perspective from the master himself, in the context of the great building site of Saint Peter’s in Rome. There, the problems posed by architectonic representation were at the heart of the debates, where Alberti’s treatise on painting was known, and where Bramante’s very presence guaranteed a link with Piero della Francesca. It was not until later, during his stay in France, that it was possible for Serlio to consult the copy of Leonardo da Vinci’s treatise owned by Benvenuto Cellini. The printed treatises by Pélerin, Dürer and Alberti were available in France at the time Serlio was writing, and it is almost sure that they were on his work table. Book II concludes with a short part devoted to material perspectives in stage design. This short treatise opens with the drawing of the section and a scale drawing of a theatre, followed by the description of the three types of scenes (comic, tragic and satirical) illustrated by famous engravings. Again in this case, Serlio is less interested in providing a general theory than to demonstrate a method that he used in 1539 for the project of the wooden theatre at the Palazzo Porto in Vicenza. “Something which I managed to do so successfully”, he says in fact, “that I have kept to this course ever since when making these things” (f. 65, Hart & Hicks 1996, p. 83.). Serlio asserts that “l’orizonte delle scene” (the vanishing point) must not be drawn in the same way as in drawn perspective; since the stage “is material and in relief, it is absolutely correct to take this different course” (f. 65, Hart & Hicks 1996, p. 83). In practice, he suggests determining two different distances from which to see the stage: one for the foreshortening of the level of the stage, of the background scenery and for the foreshortening of the side wings painted “in maiesta”, and another one, the same height but further away, for the painted side wings placed diagonally: “it is quite clear that if the stage buildings actually have two sides which look two different ways, they will also have two different vanishing points” (f. 63, Hart & Hicks 1996, p. 82). Serlio’s tone in this text shows his great pleasure in working in the theatre; his explanations for obtaining colored lights and other details demonstrate that he was truly aware of how to produce a play. And the description of the parts of the stage and the theatre structures reserved for the public is perhaps the most precise which has come down to us from the 16th century. M. Carpo, "Jean Martin, traducteur de Serlio, 1545-1547", "Le Primo Libro traduit par Jean Martin (Paris, Jean Barbé, 1545), édition bilingue", "Le Secundo Libro traduit par Jean Martin (Paris, Jean Barbé, 1545), édition bilingue", S. Deswarte-Rosa (ed. ), Sebastiano Serlio à Lyon. Architecture et imprimerie, Lyon, Mémoire Active, 2004, pp. 131-132, 133, 135. E. Danti, Le due regole della prospettiva pratica di [...] Vignola, con i Comentarij [...] Roma, Per Francesco Zanetti M.D.L.XXXIII, Bologna, Cassa di Risparmio di Vignola, 1974. S. Frommel, "Sebastiano Serlio Prospettico. Stages in his Artistic Itinerary during the 1520s”, F. Lemerle & M. Carpo (ed. ), Perspective, Projections & Design. Technologies of architectural Representations, London/New York, Routledge, 2008, pp. 77-94. M. Kemp, La scienza dell’arte. Prospettiva e percezione visiva de Brunelleschi e Seurat, Florence, Giunti Editore, 1994, p. 78 (1st ed. : New Haven/London, Yale UP, 1990). J.-P. Le Goff, "Études sur le Livre II du Trattato di Architettura de Sebastiano Serlio (1475-1554): Il secondo Libro. Di Prospettiva (1545)", Routes du livre italien, publication on line on the website of the Maison de la Recherche en Sciences humaines de Caen Basse-Normandie (2009). N. G. Poudra, Histoire de la Perspective ancienne et moderne..., Paris, Corréard, 1864. L. Pacioli, De divina proportione, introduction by A. Marinoni, Fontes ambrosiani in lucem editi cura et studio Bibliothecæ Ambrosianæ, 72, Milan, Silvana, 1982. P. Roccasecca, "Sebastiano Serlio: la pratique de la perspective au service de l’architecte", F. Lemerle & M. Carpo (ed. ), Perspective, Projection, Projet. Techniques de la représentation architecturale, Les Cahiers de la recherche architecturale et urbaine, 17, pp. 61-70 (engl. transl., "Sebastiano Serlio. Placing Perspective at the Service of Architects", F. Lemerle & M. Carpo (eds. ), Perspective, Projections & Design, London/New York, Routledge, 2008, pp. 95-104). M. N. Rosenfeld, "From Bologna to Venice and Paris: The Evolution and Publication of Sebastiano Serlio’s Books I and II, On Geometry and On Perspective, for Architects", L. Massey (ed.) The Treatise on Perspective: Published and Unpublished, Studies in the History of Art, 59, Center for Advanced Study in the Visual Arts, Symposium Papers XXXVI, National Gallery of Art, Washington, 2003, pp. 281-321. Sebastiano Serlio on Architecture, Vol. 1, Translated from the Italian, with a commentary by V. Hart and P. Hicks, Yale, Yale University Press, 1996. M. Vène, Bibliographia Serliana. Catalogue des éditions imprimées des livres du traité d’architecture de Sebastiano Serlio (1537-1681), Paris, Picard, 2007.